The best loved campground in the area. For over 50 yrs Camp A Way has been the leader in the best guest experience and amenities. Huge dog park, big rig pull thrus, wifi. Great family toys, WaterWars, ZoomFloom & heated pool. Super easy to get to from the freeway. Got the last available spot on the holiday weekend Friday night (also a Huskers home game weekend). It was a Premium spot but well worth the extra cost. Check-in was easy, the office staff was friendly and guided us to our spot. From what we saw the grounds were very well kept and the bathrooms/showers were clean and tidy. The site were very clean and easy to access. The staff are there to make sure you have no issues. Pool, restroom, showers, laundry room, and grounds all kept clean. We were assigned a very poor site that was very difficult to level and the electric outlet was beyond reach without an extension. The sewer also was beyond the reach of my hoses. When I complained and asked for another unused site that was not reserved I was told it would cost another $5.00. We were very near the very loud interstate. This was the worst campground we stayed at on our month long western trip. A very poor attitude from management for thinking money is more important than pleasing its guests. I will never stay there again. The staff is super friendly. The grounds are very well kept and clean. Lots of things for the kids to do. We had a great time. 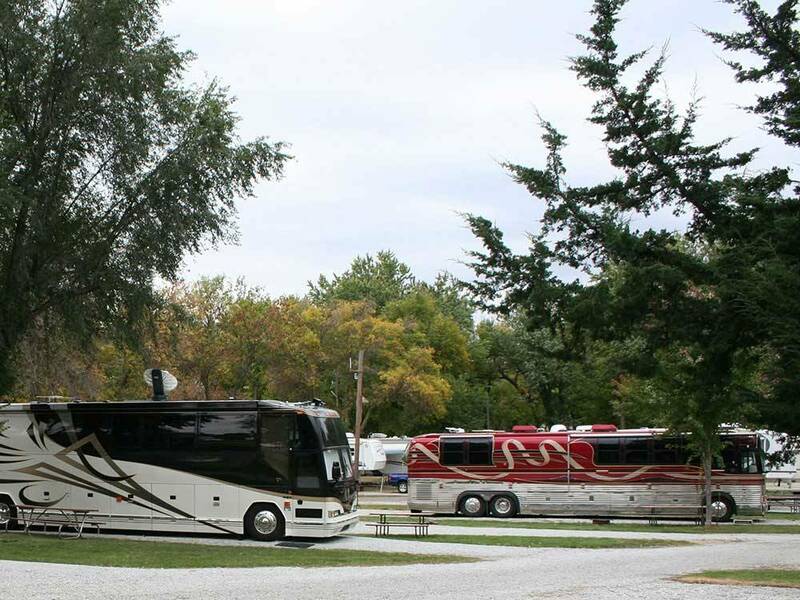 We enjoyed a couple of days at Camp Away, it is very charming and loaded with nice mature trees, The sites are well organized and easy to enter with large trailers. We did not use any of the facilities so we have no opinions. We will stay here again should we journey that way. By the way if you have time visit the Speedway Motor Museum it is fantastic. This turned out to be a very nice park. I was concerned about noise due to it's location next to the intersection of 2 major highways. I asked for and received a spot as far away from the highways as possible so we didn't hear any noise from them at all. Staff and facilities are excellent with the exception of the internet. As in most parks it's dreadfully slow to the point of being unusable. Tried to do a speed test but it was so bogged down I couldn't even get the test page to load. Switched to my iPhone and immediately got 16.49mbs download and 3.05mbs upload and that's with only 2 bars on the phone through ATT. The park is just across a 4 lane road from an extensive network of walk/run/bike paths in nice safe areas. Walmart/Sams only a couple of miles away and Sam's has a fuel station. 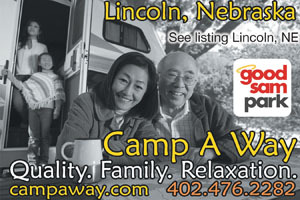 If we have a need to stop in Lincoln again we will certainly stay with Camp A Way. Stopped here 2 different times for 2 nights each. It is well planned out and the sites are large with plenty of shade from huge trees. It is one of our favorite parks and we recommend it to others. Lots of space to more the RV in and out of the site. The dog park is very large and nice. It is a lovely park to walk through with a variety of views. The bathroom is very nice as well as the laundry room. Staff are very friendly and it is family owned and operated. Plan on stopping again next year for 4 nights in a row so we can go to Council Bluffs. I stayed at Camp A Way in June of 2016. What a nice place! The site are long and wide. the people were very nice and helpful. They have a very large dog park. It was clean and very well kept. Great place to stop and rest for a couple of days. I would come here again! We stayed twice in July and I will say I grew up in the Lincoln Area but never knew it was there it in a out of the way spot but close to everything one of the best Travel sites we have stayed in. I spent a week at the park. Everything was just spectacular! What a great group/staff. Grounds were clean and well kept. We loved the trees and pleasant surroundings. We were only there overnight but felt welcomed. It was an easy and comfortable night.